It is very important that well water be tested before installing a feeder system to prevent rust stains. The particular Rid O' Rust Formula you use and the amount you put in the feeder tank depend on the test results. This kit contains the necessary material to conduct two test of the following. Get professional test results with this 8 parameter home test kit. The first step to healthier water. 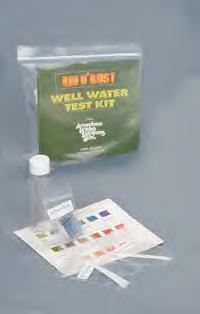 This water test kit comes with 2 of each following test.